An Israeli former reality show contestant has been arrested and charged in the United States for alleged binary options fraud, The Times of Israel has learned. 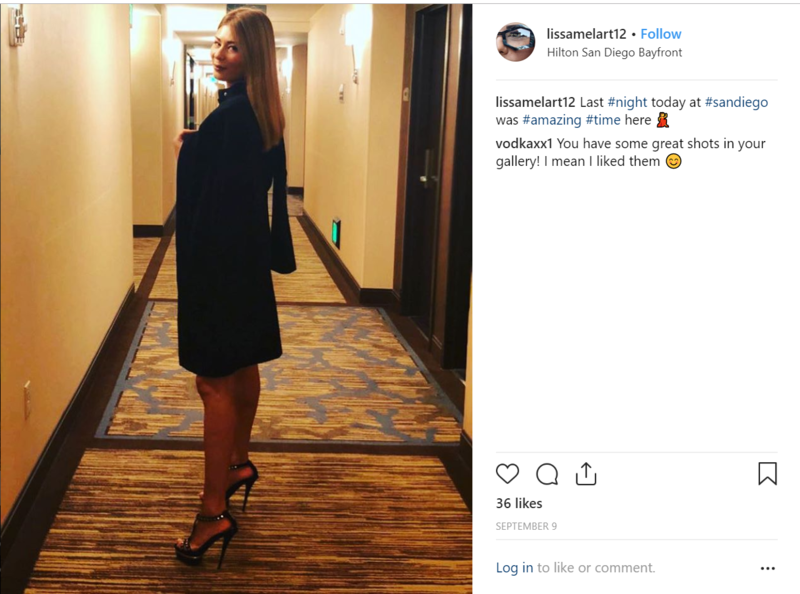 Lissa Mel, 30, who also goes by the name of Melissa Turdiev, was arrested by the FBI on September 17 at Los Angeles International Airport as she attempted to board a plane back to Israel. The Times of Israel learned of Mel’s arrest when the US Justice Department published information about her case on a recently created website dedicated to the case of another alleged binary options fraudster, Lee Elbaz, who was arrested upon arrival at John F. Kennedy airport in New York in September 2017. Mel allegedly worked as a retention agent for the binary options websites BigOption and BinaryBook, where Elbaz, whose trial is set to begin on January 7, was CEO. Mel had a plea hearing on December 13, 2018, but the documents revealing what happened during that hearing are sealed. A former federal prosecutor consulted by The Times of Israel suggested that she may have pleaded guilty and agreed to cooperate with federal prosecutors, although there is no way to know for sure. She faces up to 20 years in prison. The affidavit also alleges that representatives of BigOption and BinaryBook deliberately targeted vulnerable populations. According to the affidavit, Mel responded to this email with “Thank you” and a smiley emoji. According to the affidavit, the FBI is in possession of at least two recorded phone calls in which Mel encourages investors to deposit as much money as possible with the knowledge, the affidavit alleges, that the investors will lose some or all of their money. A binary option is an option contract whose payoff depends on the price of another asset, like gold, wheat, or Apple stocks. If the holders of the options guess correctly about the direction that the price has moved at the time of expiry, they earn a predetermined amount of money, and, if not, they lose the money “invested” in a particular trade. In the case of the Israeli binary options industry, companies offering these contracts were largely fraudulent. They would dupe victims worldwide into believing that they were successfully investing and earning money, encouraging them to deposit more and more into their accounts, until the company eventually cut off contact with the investor and disappeared with all or almost all of their money. The industry is estimated to have stolen billions of dollars from victims worldwide over a period of 10 years. Israel banned the entire industry a year ago. Since then, many former binary options operatives have pivoted to other financial products, including initial coin offerings (ICOs). Despite the fact that more than 10,000 people are estimated to have worked in the industry, many of whom engaged in activities not substantially different from those allegedly carried out by Mel, Israel has yet to prosecute a single alleged binary options perpetrator. BigOption and BinaryBook are only two of hundreds of such websites run from Israel in recent years. According to the complaint against Mel, BigOption and BinaryBook each earned about $80 million in revenue from the second quarter of 2014 through the fourth quarter of 2016. In a memorandum filed in the case, the Justice Department explained why it brought charges against Mel, even though she was not a high-level binary options operative. “Although the Defendant did not participate at a high level of the conspiracy, the role that she played was vital to the scheme. Indeed the scheme could not have been successful without the participation of people like the Defendant — the people operating at the front lines of a complex and sophisticated scheme who spent their days luring, speaking with, and corresponding with victims who were defrauded of millions of dollars,” the memorandum charged. Claiborne Porter, a former acting principal deputy chief of the United States Department of Justice’s Money Laundering and Asset Recovery Section, told The Times of Israel that the protocol of Mel’s plea hearing may have been sealed because she decided to plead guilty. Porter said that there are other reasons to seal the record of a plea hearing as well — for instance, if a suspect has health problems and requested that that information be kept private. Mel achieved minor celebrity in Israel in 2008, at the age of 19, when she was a contestant on the first season of the reality-TV show, “Hayafa Vehahnun,” the Hebrew-language version of the international franchise “Beauty and the Geek,” in which beautiful young women team up with young men perceived to be smart, yet socially awkward, to compete for cash prizes. The website also said that Mel moved to Israel at the age of 11 from Uzbekistan and grew up in the tony suburb of Herzliya Pituach. She was the daughter of professors, but was not herself a good student, the website said. She worked at a high-end men’s boutique and also had work experience as a jewelry designer, makeup artist, lifeguard, and a dentist’s assistant during her military service. Mel arrived in the United States on a tourist visa on September 6, according to the affidavit. On September 11, the FBI interviewed her at the residence where she was staying. Mel had been scheduled to fly back to Israel on September 17, but after the visit from the FBI, she attempted, but failed, to reschedule her flight to leave on the 13th, according to the FBI. Mel was arrested on September 17, as she attempted to board her originally scheduled flight. READ Binary option scams: how to get your money back? Some of the documents concerning Mel’s conditions of release are sealed and not accessible to the public, but other documents filed in the case suggest that her movements are severely circumscribed and her location is being monitored at all times. On December 7, Mel’s lawyer, Jonathan Biran, requested special permission for her to attend a Kundalini yoga and meditation class once a week, near the Los Angeles residence where she is staying. Mel’s bail was set at $275,000, $250,000 of which was paid by David Balmas, a Los Angeles businessman in the construction industry. Balmas is also Mel’s third-party custodian, meaning he is responsible for making sure she attends all her scheduled court appearances. After her arrest, Mel signed papers saying she is currently employed, but the name of the company she worked for was illegible. According to Mel’s LinkedIn profile, at the time of her arrest, she worked for an Israel-based company called Algowave that describes itself as a platform for trading cryptocurrencies. The Times of Israel reached out to Mel’s attorney, Jonathan Biran, for a response to the allegations against her. Elbaz, 36, has been charged in the District of Maryland with one count of conspiracy to commit wire fraud and three counts of wire fraud, according to a Department of Justice press release. Each of these four charges carries a maximum penalty of 20 years in prison. Meanwhile, on December 3, the US Securities and Exchange Commission charged Mark Suleymanov of Glen Cove, New York with defrauding investors out of approximately $4 million, through the binary options websites SpotFN, BinaryAcademics.com, and JanusOptions.com, among others. Suleymanov has subsequently agreed to a monetary settlement with the SEC, in which he neither accepts nor denies the allegations in the complaint. Suleymanov was also charged in a parallel criminal case brought by the US Justice Department. Suleymanov was arrested by the FBI in July 2018. He was released on $500,000 of bail and spent several months under house arrest with an electronic monitoring bracelet. His attorney told The Times of Israel that under the terms of his settlement with both the Justice Department and SEC, the criminal charges have now been dropped. According to a July 21, 2018, affidavit filed by the Justice Department, the FBI investigation was prompted by numerous complaints against the company behind the SpotFN.com website, SpotFN Ltd, which was purportedly based in the UK. According to the affidavit, the FBI learned that the site was actually run by Suleymanov when the agency subpoenaed information from Domains by Proxy, a company that allows website owners to conceal their identities. The FBI ascertained which email addresses Suleymanov had used to register these domains and obtained search warrants that enabled it to read Suleymanov’s emails. According to information available online, SpotFN appears to have operated a call center in Costa Rica. Nevertheless, the site appears connected to Israel in that it used the platform of SpotOption, an Israeli company. In addition, the British company behind the SpotFN website, SpotFN Ltd. was originally registered, in January 2014, care of another British company, Zynatech International Limited, incorporated on February 22, 2012, and directed by an Israeli woman named Tova (Tatiana) Pinchasov. Before it was dissolved in October 2014, Zynatech International UK was owned by Zynatech International Limited in the Seychelles, a company incorporated in February 2008 and inactivated on January 2, 2014. According to the Panama Papers Leak of 11.5 million documents from the Panamanian law firm and corporate service provider Mossack Fonseca, the Seychelles company was also directed by Tova Pincahsov of Tel Aviv. The Times of Israel has seen documents showing that Zynatech International Limited in the Seychelles was incorporated in 2008. Its owner’s identity between February 28, 2008, and March 19, 2012, is unknown, but on March 19, 2012, Tova Pinchasov also became the owner of the Seychelles company. The Times of Israel contacted Pinchasov in an attempt to ask about her connection to SpotFN, but she did not respond. Suleymanov immigrated to the United States from the former Soviet Union, as a member of the Bukharan emigre community from Uzbekistan and Kyrgyzstan. In addition to his alleged binary options activity, SEC filings show he is a shareholder in a company called Diamond Technology Enterprises Inc.
Suleymanov’s lawyer, Albert Y. Dayan, told The Times of Israel that he will not be indicted. Claiborne Porter, the former US Justice Department official, told The Times of Israel that most likely what happened is that the US government reached what is called a “global settlement” with Suleymanov. The cases against Mel and Suleymanov are two of about a dozen cases in which the US government has brought charges against alleged binary options fraudsters with connections to Israel.